Chrome hooks coordinate with many posts! 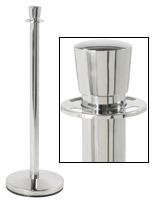 78" length sets stanchions a perfect 6' apart! 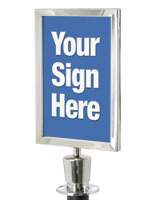 This rope barrier is perfect for configuring with post stanchions. If you're looking for the ultimate in upscale or classic crowd control at a reasonable price, you've found the perfect solution. 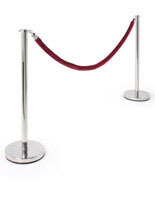 This rope barrier, also known as a burgundy velvet rope, is ideal for crowd control and queue management in a wide variety of locations. 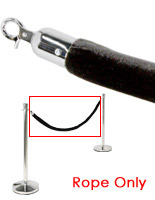 Configure the classic rope barrier with black or chrome posts for effective crowd control and queue management solutions in restaurants, bars, nightclubs, museums, ticket offices, theaters, hotels, casinos or red carpet events. 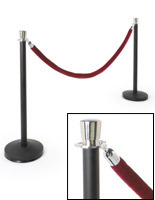 The burgundy rope barrier adds just the right amount of upscale elegance to any environment! 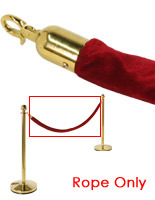 This velvet rope, classic rope barrier features polished chrome ends with lobster claw style hooks to affix the rope to posts. 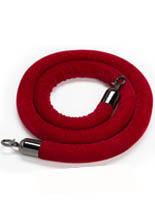 The rope barrier features a foam core, wrapped with lush burgundy velvet. The rope is 78" long, so when affixed between two stanchions at the recommended height from the floor (24" for safety compliance reasons), your posts will stand about 6 feet apart. 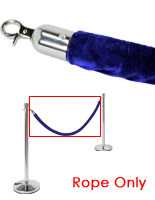 When compared with shorter rope barrier options, this actually saves you money, as you will have to purchase fewer rope barriers and fewer stanchion posts for your space. The rope barrier is about 1.65" in diameter and weights just over 1lb. These velvet ropes were just what we needed to finish our display in our gun store. Great quality and the color was very rich.